“Allah ya kiyaye! Allah ya kare! Allah ya kai ku lafiya,Don Allah ka ba ni kudi Allah zai zo da kudi a cikin iyali ‘ the Hausa version of yet another tiny voice. Turning your head sideways, trying to find out where the voice is coming from with your eyes rolling back and forth just to see who spoke or rather who is speaking. The first thing you see is a bowl, to be specific a blue small bowl resting on a very skinny long arm. At the site of that you become more curious then you stretch your neck more in search of what kind of tiny arm will that be. Looking downwards are skinny legs without footwear in a faded brown shot or probably long dirty skirts with holes around them,one could almost see what the cloth is meant to cover. For the male usually with no shirt, while for the female covered with dirty dresses most times hijab. These are the voice of children between the ages 4-10 begging on the streets to earn a living rather than been in the four walls of a classroom studying to become great leaders of tomorrow. They are a common sight in the Northern states including Kano, Katsina, Kebbi, Niger, Gombe, Kaduna, Jos and Sokoto. According to the statistics released by the Ministry of Education in 2009, Kano State alone harbors 1.6 million Almajiris in some 26,000 madrassas. Sokoto, Kaduna, Niger and Borno states are home to approximately 1.1 million, 824,200, 580,000 and 389,000 Almajiri pupils respectively. They also have a large presence in neighboring West African countries like Mali, Togo, Niger Republic, Chad and Cameroon. 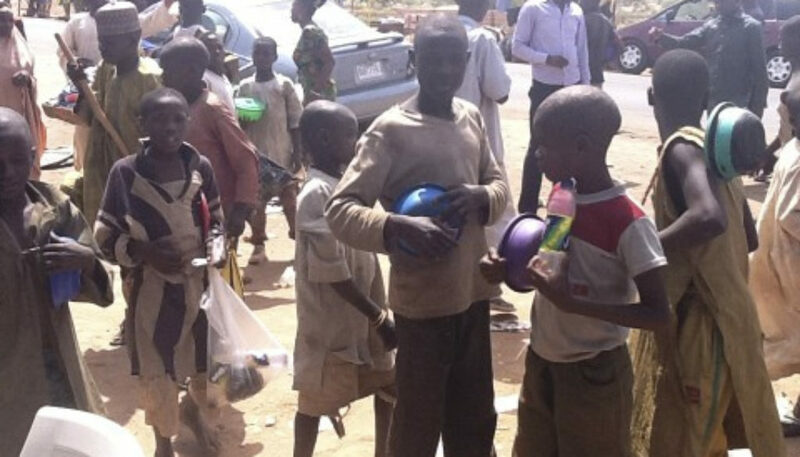 In Northern Nigeria alone, they are estimated to be about 10 million—indicating that approximately one out of every 16 Nigerians and one out of every 7 Nigerian Muslims is an Almajiri. Granted that their number is a million more than the population of Sweden, they are a social menace and a liability on the Nigerian populace, and they help sustain a misconception—that Muslims are uncivilized and backward. Over time the usual lifestyle of these Alamajiri begins with morning Qur’an recitation and memorization from the pre-dawn prayer (salatul subhi) till around 7:30am. After this— without bathing and sometimes without chewing a stick (an alternative way of brushing teeth)—they go into the streets, local food parlors, mosques, motor parks, markets, residences of wealthy persons and social gatherings; begging. Some also engage in domestic chores in exchange for a bowl of food or worn-out clothing items. This system of begging by children must be stopped remodeled and integrated. It is my opinion that our leaders most especially from the northern region come together as one and tackle this phenomenon.However, the solution to this problem may not be rapid one but i am most certain it’s going to be a gradual one.